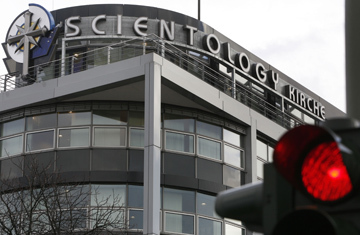 Scientology Trial in France: Can a Religion Be Banned? In a scene in a new fictional movie about Scientology called Until Nothing Remains, one of the group's leaders is giving an impassioned speech to followers in Germany. The camera pulls in tighter on the man's face and, all of a sudden, he cries out "Clear Germany!" to a round of rapturous applause. No, he's not talking about pushing all nonbelievers out of the country  he's referring to the state of "clear," a condition characterized by an absence of painful, reactive and uncontrollable emotions. Because of scenes like this that Scientologists believe depict their religion in a frightening way, the group is not the least bit happy about the film, which airs on Germany's ARD public-television network on March 31. In fact, Scientologists claim they are the victims of a "hate campaign" being propagated by the movement's critics. But Carl Bergengruen, the head of drama at a public broadcaster in southwest Germany who was instrumental in getting the movie made, insists that the filmmakers did not set out to vilify Scientology but to show how people can be drawn to "promises of salvation." The movie tells the story of a young couple, Gine and Frank Reiner, who are taken into the religion through the manipulative tactics of Scientology recruiters. Eventually, the husband decides to leave the group, losing not only his wife in the process but also his young child and a big portion of his family's inheritance, which his wife has donated to the church. Bergengruen says the film is loosely based on the real-life experiences of a German man named Heiner von Rönn, a onetime member of the organization. He says the filmmakers conducted exhaustive research in order to portray the religion as realistically as possible, including interviewing various former Scientology members and even going undercover to find out more about how the group works. That such a negative portrayal of the religion is being produced in Germany is not surprising. Although the group has several thousand members in Germany, Scientology is not officially recognized as a religion and the German government monitors its operations. Authorities even tried to ban the group three years ago  a move that failed due to lack of evidence that the group was undermining the constitution. That was when public mistrust of Scientologists was at its peak in Germany due to the controversial filming of the Tom Cruise movie Valkyrie. Many Germans were outraged that Cruise  with his strong affiliations with Scientology  had been chosen to play the role of Claus von Stauffenberg, a Nazi resistance fighter whom some Germans regard as a national hero because of his attempted assassination of Adolf Hitler. Defense Ministry officials criticized the decision to allow the filmmakers to shoot scenes at historic German landmarks, such as the Bendlerblock where Stauffenberg was executed in 1944. But the final straw for many Germans was when Cruise was awarded a prestigious Bambi media award  similar to an Oscar  for his work in the film. Cruise answered his critics in a 2007 interview with People magazine, asking Germans to "save your comments until you see the movie." "I want to think positive and concentrate on the film," he added. "I carry a great responsibility to the Germans, for whom a man like Stauffenberg means so much." Scientologists say Until Nothing Remains presents an inaccurate view of their religion and that they're looking into taking legal action against the network. "Of course this must have consequences. Our lawyers are looking into this very carefully," Sabine Weber, a Scientology spokeswoman in Germany, tells TIME. She says she has only seen clips of the film, but at times she couldn't help but "laugh out loud." She refers to a scene in which the achievement of the state of clear is celebrated with alcohol, calling this "unthinkable." In another scene, the film depicts what could best be described as a Scientology penal camp, which Weber says doesn't exist. To voice their frustrations, the group's members have distributed flyers outside a screening accusing the filmmakers of discrimination. Weber says the group is even working on its own movie to tell its side of the story. That film includes interviews with Rönn's ex-wife and is expected to be released before the airing of Until Nothing Remains. Ursula Caberta, head of the Hamburg Interior Ministry's Scientology Task Force and one of the consultants of the ARD network's film, says she doesn't see the harm in scrutinizing the group's practices through film. "I keep waiting for a big Hollywood picture on the topic," she says. It's probably safe to say that Cruise won't be starring in that vehicle  unless it paints Scientology in the proper light. Read "Scientology Trial in France: Can a Religion Be Banned?" See pictures of East Germany making light of its past.